Rite-Hite’s LiteSpeed Clean high-speed door has been designed to deliver maximum clean room integrity, reliability and safety. 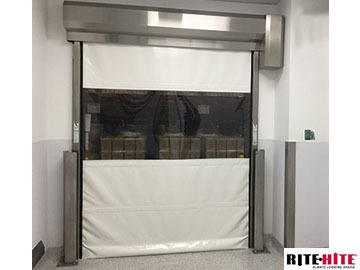 The high-speed roll-up door is compliant with guidelines established by clean Good Manufacturing Practices, the Food & Drug Administration and the United States Department of Agriculture. Made from a tough PVC vinyl curtain, the LiteSpeed Clean has a tapered design that uses non-exposed fasteners, making it more resistant to collecting dust than flat surfaces and easier to clean. It can maintain room-to-room pressure differentials of up to 0.2 InWC with its tight seal. Its roll-up design translates into a peak operating speed of 65” per second and a smaller physical footprint. Using available safety presence sensors, personnel working near the door are likely to avoid a collision. However, if the LiteSpeed Clean is bumped or impacted, the TRUE Auto Re-feed™ will automatically reconfigure the door back on its tracks. This eliminates a potential breach in a clean room environment and the downtime and costs associated with repairing a traditional door. In addition to its ability to function well in clean environments, the LiteSpeed Clean also comes with an array of safety features. Most notably, the bottom of the high-speed door features Soft-Edge™ Technology, which provides a higher degree of protection for product, personnel and equipment. An optional full-width vision panel allows workers to see what’s on the other side of the door. A reversing slack sensor can reverse the door’s course if an obstruction is sensed. Rite-Hite Corporation, headquartered in Milwaukee, Wisconsin, is a leading manufacturer of material handling systems designed for maximum safety and productivity. Principal product lines include: trailer restraints, dock levelers, integrated controls, dock seals and shelters, industrial power doors, HVLS fans and aftermarket products and services. For more information, please visit www.ritehite.com.